Sometimes I think we must have been temporarily insane to buy this house. There isn’t one square inch of this place that doesn’t need work. In it’s 150+ years of life, there’s been one hack job after another. Linoleum, mirrors hot glued to the walls, horrible paint jobs. The list goes on. The one great thing is that we’ve got tons of space and the possibilities are endless. I’m not a carpenter, I’m not an interior designer, I’m not a general contractor, and my budget is a constant reminder that I can’t hire any of those folks. So I’ve had to rely on my own two hands. Scary thought since I’d never even painted a wall before buying this house, but no guts- no glory, eh? I covered each pane with duct tape so that the glass wouldn’t shatter all over the floor as I pried them off the wall. Of course the glue that was holding them up took some of the drywall with it, so I had to patch the walls with Ready Patch. I really hate linoleum. Maybe I’m being dramatic because I’ve been fighting with the floors in this house for so long, but I just can’t understand why linoleum was ever a thing. So yeah, I tore the linoleum up. The floor underneath was in ok condition. I rented a sander from Home Depot and stained the floor a dark color. Step 3. Paint! Paint! Paint! The first order of business was to get rid of that ugly turquoise paint. I painted all the trim a semi gloss white. For the walls, I went with Behr’s Tapestry Beige (I love this color, such a perfect neutral). 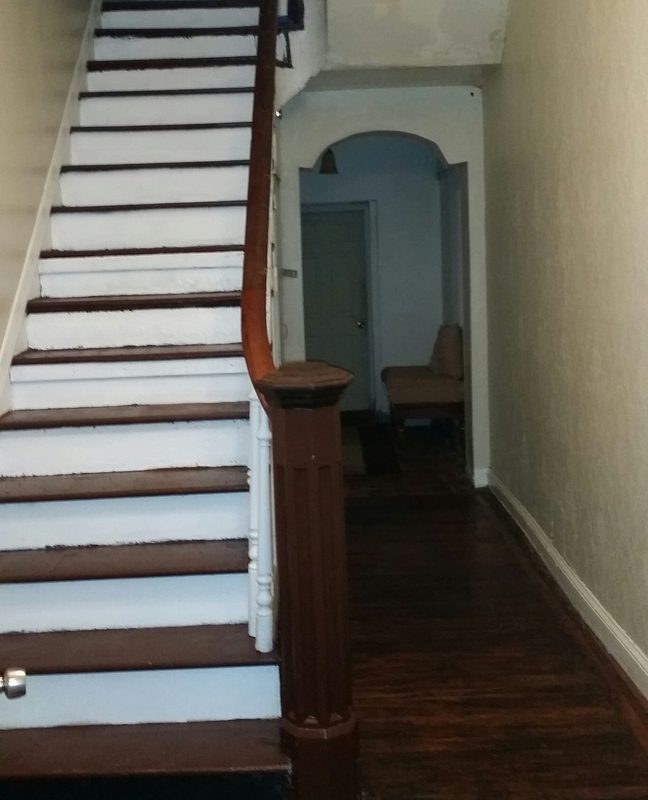 The stairs are just a brown deck/floor paint they suggested at Home Depot. 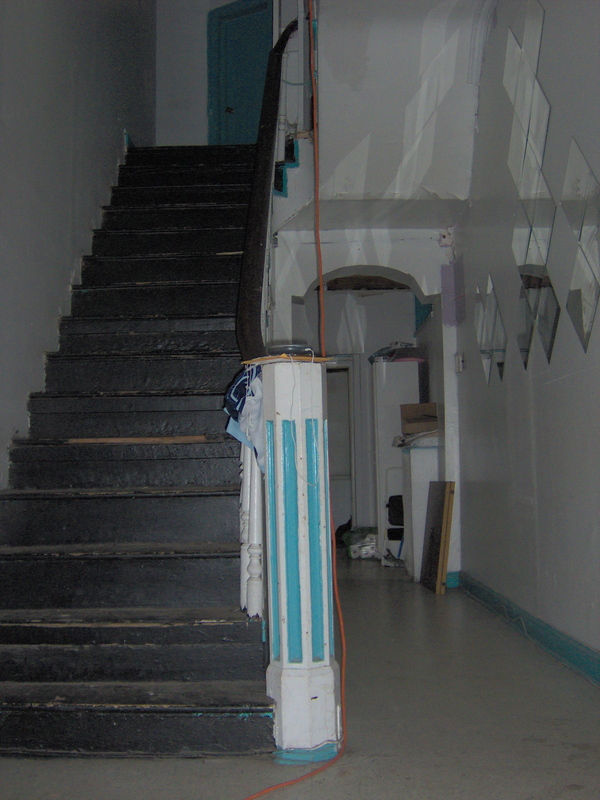 If you’re going to paint some stairs, get a second opinion. The paint they suggested bled through the tape, so the lines aren’t as sharp as I wanted them to be. Grrr!!! Again, I’m not a professional, but I really do think I was able to create the illusion of a nice entry hall 🙂 In the future, we’ll be able to call in some folks that actually know what they’re doing, but in the meantime, we don’t have turquoise paint staring us in the face! I’m thinking about painting my banister and am procrastinating because I know how much work it will be-but you did the whole thing! Good job! It really is a lot of work! Don’t worry too much about procrastinating… it took me a long time to start!